We’ve noticed during these past few Autumn-like days (fine, weeks) that our Etsy shop Ian Drummond Stash has had increasing traffic from those who participate in indoor winter sports. But, you know, our kind of sports: sewing, dressmaking, quilting and crafting. Today we were eyeing the towering racks stocking our laces, bibs and bobs and bits and pieces that are due to hit the shop this winter from one massive collection we absorbed, and we sighed. They look like snowfakes, and we’re not ready. 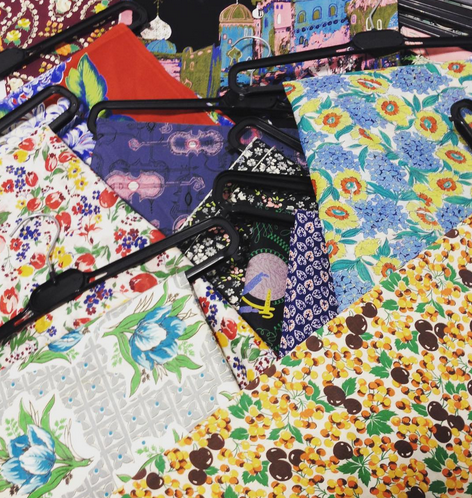 We realized that the best way to extend the feel of summer is to look at cheery cottons and flowered prints, and novelty prints evoking the Casbah. So this week we’ll behave, complete our film work like good studio employees, and treat ourselves to getting these vintage fabrics and materials listed. And while the weather may be chilly, our hearts are warmed by this enlightening post by the Kindness Blog: Flower Sack Dresses from the Flour Mills. We have a good stock of such fabric in the Stash shop, and it’s always a little thrill when some flour/feed sack prints turn up in the period clothing for our movie wardrobe rental stock.